After an involving ("take a new way - got to get it right") soul/folk intro with TV News samples, DJ Day< offers an humble piece of jazz/hip hop groove, his own kinda way of making "things better", and the "Mizell-Brothers-meets-Dilla" tag from the press release is kinda unbeatable... and the music makes me want to have the vinyl on my turntable to try and slow it down cosmic funk-style immediatly! The B-side starts on a more optimistic vibe, with the joyful & charming cosmic soul of "A Place To Go", and the EP closes on some energetic soul, with scratches, guitar, flute and background vocals... All in all, positive psychedelic soul/hip hop moods which grooves in the heart. 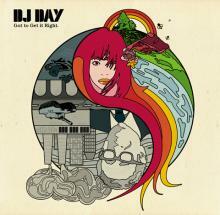 DJ Day goes on a Mizell-Brothers-meets-Dilla-mission with this "What's Going On"-style EP. Soul music for 2007. When he started working on the tracks in July 2006 the war between Israel and Lebanon had just begun and it clearly affected the way the music turned out. "I made this record not only for you, but also as a message to myself. ", Day says in the liner notes. "Sometimes it's important to step outside of your world and look at where we're headed as people. That is what I tried to do with this record."